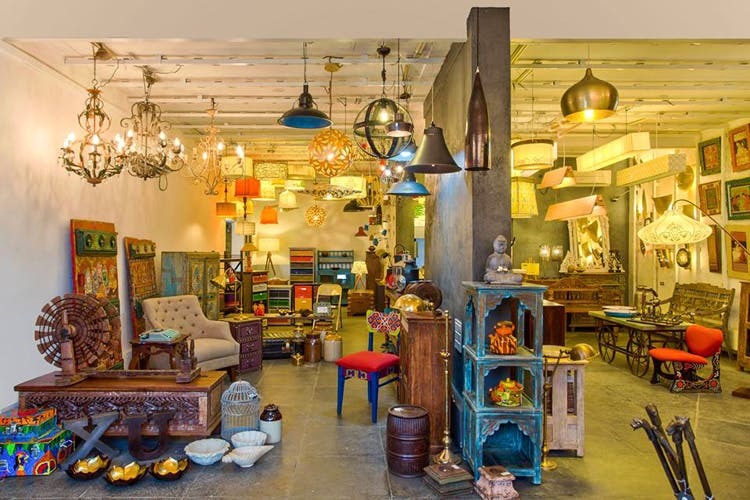 A charming store that offers everything from lighting and furniture to home accents, The Purple Turtles is your go-to place for elegant home decor in Indiranagar. The window display at lighting Purple Store is quite the sight. Floor lamps, table lamps, giant lamps and ceilings lamps all come together to present a gorgeous display. Plus, their classy home decor offerings. From distressed furniture and block-printed cushions to bed covers and printed rugs, find it under one roof. While most of what you see here is the work of their in-house design team, they also have limited edition pieces, handpicked by the founder, from India and abroad, as well as upcoming Indian designers who want to showcase their products. While you get to pick from their comprehensive range of lightings which includes metal lanterns, floor lamp stands, hanging helix lights, tall skyscraper shades and even cutesy table lamps, we suggest you also keep an eye out for the more interesting variants. Think Channapatna lamps, desk lamps featuring industrial designs and shades made of banana fibre. Offering a great choice of materials and contemporary designs, they are also up for customising lightings according to your preference, right from conceptualising it to the final installation. Spread across three floors, the store has an impressive range of distressed furniture (cupboards, benches and chairs), seating options (poufs, box seats and armchairs) vibrant cushions and embroidered cushion covers, and bed covers. You will also come across pickle jars and glass jars in different sizes. Tucked away in a smaller room (on the first floor) which has the faint smell of old furniture, are trunks in various designs – iron, carved and tribal. Oh, and vintage-looking typewriters, mirrors and planters to check out, too.